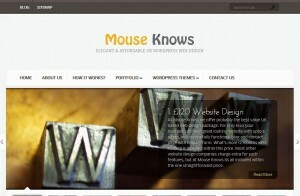 Choice of a selection of premium WordPress themes to base your site upon. Upto 4 static pages, or 3 static pages plus Blog. Contact page, including contact form and Google map (if required). Implementation of graphical slider (dynamic image changer) on Homepage (if supported by chosen theme). Add new pages to your site. Upto 2 email accounts or forwarding to another email address. The only thing which is not included within the base package price is the registration of a domain for your website. As most clients prefer to retain ownership of their domain, we suggest that you register it via a company such as 123-Reg who offer very reasonable prices for domain registration. Once registered we can point the domain to our webservers to make your site live, but the domain itself will always be your property and fully under your control. If you are looking for a conventional HTML based bespoke website design we also offer this service, please contact us for more details.